The kinds of alien planets that orbit distant stars may be revealed by taking a close look at the elements that make up those parent stars, researchers say. Astronomers have so far confirmed the existence of more than 1,000 planets beyond our solar system with the aid of NASA's Kepler spacecraft and other telescopes. They are investigating thousands more candidate worlds to see if they, too, are exoplanets, or extrasolar planets. "We don't have any planets in our system between one to four times the size of Earth, so we'd really like to find out what they are," said lead study author Lars Buchhave, an astrophysicist at the Harvard-Smithsonian Center for Astrophysics in Cambridge, Massachusetts. Rocky or not: What’s inside that alien planet? The available evidence suggests these worlds range in composition from small, high-density rocky planets with thin envelopes of gas like Earth, Mars, Venus and Mercury to bigger, low-density planets consisting of rocky cores with thick envelopes of hydrogen and helium gas. 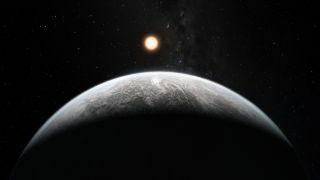 However, to deduce what the compositions of these exoplanets might be, astronomers need to know their densities, which entails knowing both their sizes and masses, and while scientists can now readily observe what size an exoplanet is, "determining the mass of a planet is very difficult," Buchhave said. To learn more about this unknown range of exoplanets, scientists tried looking at their stars. They focused on metallicities — that is, the abundances of elements heavier than hydrogen and helium — of more than 400 stars hosting 600 candidate exoplanets. The investigators discovered these remaining exoplanets could be placed into three groups based on how metallic their stars were. The greater the average metallicity of a star, the larger its planets usually were. The investigators noted the metallicity of a star was a hint of how much solid material initially existed in the protoplanetary disks of gas and dust surrounding them. The greater the metallicity of a star, "the more rocky cores of planets form quickly and have time to accrete hydrogen-helium envelopes and become big planets," Buchhave told Space.com. The researchers suggest these three groups reflect three different kinds of planetary composition. Exoplanets less than 1.7 times Earth's diameter are predominantly rocky planets. Worlds between 1.7 and 3.9 as wide as Earth are so-called gas dwarf planets with rocky cores and envelopes of hydrogen and helium gas. Planets larger than 3.9 times Earth's diameter are gas giants like Jupiter and Saturn or ice giants like Uranus and Neptune. The scientists also predicted that planets farther from their star could be large rocky planets without thick atmospheres of hydrogen and helium. Their analysis not only confirmed this prediction, but also suggested that gigantic planets could form with relatively thin atmospheres. "These would be massive, massive rocks," Buchhave said. In the future, Buchhave noted the Transiting Exoplanet Survey Satellite (TESS), a space telescope planned for NASA's Explorer program, "could discover a large number of exoplanets orbiting bright stars, making them amenable to subsequent mass measurement and thus helping to find out what they are made of." Buchhave and his colleague detailed their findings in the May 29 issue of the journal Nature.